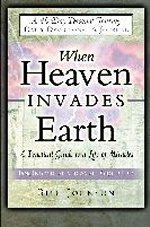 Description: Bill Johnson’s When Heaven Invades Earth becomes a course of training through the use of this study tool. This journal/study guide takes the foundations laid by the author and constructs a framework to engage the miraculous through 40 days of exercises and meditations. It focuses on walking in the divine as a lifestyle, shaping one's attitudes and world-view.